Chaturanga Dandasana, also known as Low Pushup Position is one of least spectacular yet most challenging poses. Chuturunga has significant benefits, but failure to perform it correctly results in serious injury. Low Pushup Position seems fairly simple and “monolithic”, with apparently no intermediary steps that would allow for a more gradual approach. Fortunately, this impression is superficial. There are quite few variations that help one develop correct alignment, and build the core and arms strength that Chaturanga Dandasana demands. Helps learning correct back alignment, and implement this alignment within a position that is close to Chuturanga, yet free of the neck and shoulder strain that is part if the last one. High Push-Up can always be toned down by lowering the knees to the floor, which allows the practitioner to really take all the time it needs to correct to learn and implement proper back alignment. Holding this pose for 45 to 60 seconds intervals develops abdominal strengths, since the abdominal area engages to brace the back and prevent overarching. It helps develop arms and chest strength. It is a great place to practice maintaining the shoulder blades flat against back, the neck in line with the thoracic spine, and the shoulders away from the ears- all key elements for correct and safe Chuituranga Dandasana. Forearms supported plank takes the intensity of High Pushup pose to a next level of intensity, while still allowing to work safely on the Chuturanga related details. It challenges the abdominals significantly more then the High Push-Up position. One can still easily correct the lower back sway by briefly bringing the knees down if necessary, readjusting the back alignment, and then get the knees off the floor again. This plank variation strengthens the core, chest, and shoulders muscles while allowing practicing proper neck and shoulders positioning. The use the chair allows the practitioner to strengthen the core, which is an essential component of Chuturunga Dandasana. The use the chair allows the practitioner to reinforce correct arms and body positioning during elbows flexion, which makes up the “core” aspect of Chuturunga Dandasana. One key detail is drawing the elbows in toward the ribcage, and reaching back through the elbows while flexing. 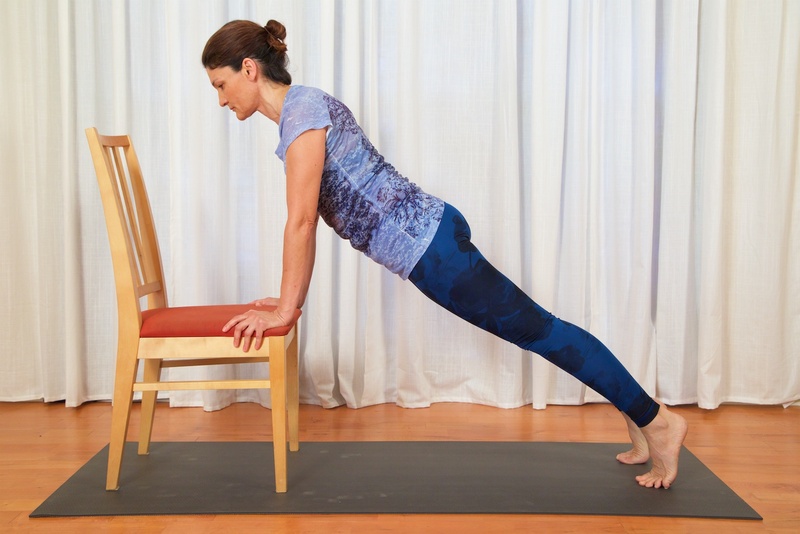 Use the chair to practice gradual lowering of the torso to the level of the arm bones, without having the elbows stick behind. Go up and down few times, mindful of alignment. Because of the support the chair provides, one can focus on maintaining the neck in line with the thoracic spine, the shoulders depressed, abs engaged, and a sway-free back. When confident enough with the knees down chair-supported pose, the student can try to do the same variation with the knees off the ground. The intensity is still a little less then in the target pose, although significantly higher then previous variations. Working in increments allows for gradual development of strength, and maintaining correct alignment while increasing intensity. This is the last intermediary step. The knees on the floor positioning lessens the intensity on wrists, shoulders, and back, and makes room for focusing on alignment and strength building, However, the challenging is significantly more then in the chair supported variation, and much closer to the target pose. The knees down allow for more gradual approach to elbow flexion: just go as far as it feels safe, without deviating from proper alignment. After this last step, the practitioner can approach Chuturunga Dandasana, as shown in the first picture.